We are sharing a guest blog from the Department for Business, Energy & Industrial Strategy, sharing information on the Heat Network Regulations. Heat Networks are growing in popularity, but its important to be aware of the regulations surrounding them. Heat networks are shared heating systems which provide a more energy efficient alternative to domestic boiler heating systems. They incorporate systems where water is heated or chilled at a central source (such as a boiler or plant room) and then channelled to customers through a pipe network for heating, cooling or hot water use. There are two types of heat network. Communal networks serve a single building containing multiple customers, such as a block of flats or offices. District networks serve multiple buildings, such as a housing estate or university campus. Heat networks are very popular in northern Europe but currently supply only around 2% of the UK’s heat demand. However, the government is promoting this technology as an important contributor towards its carbon-cutting targets. The sector was largely unregulated until the introduction of the Heat Network Regulations, which seek to establish some uniformity among operators in the way they bill customers (i.e. according to their actual consumption of heat) while also giving customers an incentive to reduce their consumption. The Regulations are also being used to create the first detailed picture of heat networks in operation throughout the UK. The Regulations are enforced by the Office for Product Safety & Standards (OPSS), part of the Department for Business, Energy & Industrial Strategy. They place duties on heat suppliers, defined as anyone who supplies and charges for the supply of heating, cooling and/or hot water to final customers through a heat network. A final customer is defined as a person, family or legal entity that is paying for their own use of heat, hot water or cooling through a heat network. Spaces that do not meet all these criteria such as shared houses with a domestic boiler, houses of multiple occupancy or university halls of residence where some services, such as cooking, are shared are therefore not considered within the scope of the regulations. In a non-domestic setting, customers are those with the exclusive use of a partitioned space such as a private enclosed office occupied by a single company or enclosed shop. Shared areas such as open plan offices or bathrooms used by more than one company, or an unenclosed concession stand in an airport receiving ambient heating. Heat suppliers must: inform OPSS of the details of their networks; install heat meters to measure customers’ consumption (where it is cost-effective and technically feasible to do so), and; use those meters to bill customers by actual consumption. Heat suppliers should inform OPSS of their existing networks as soon as possible, using the official ‘notification template’. This asks for information such as the number of buildings and customers on those networks as well as, for metered networks, the amount of heat generated and supplied. New heat networks should be identified on or before the date they become active. A fresh notification form must be completed within every four-year period thereafter. Heat suppliers will in future be required to use a cost-effectiveness tool to determine whether or not they should install heat meters. The cost-effectiveness tool will be released following a planned consultation. Where the tool gives a positive response, heat suppliers will be expected to install meters and begin billing customers by actual consumption as soon as the meters have been installed. Where the tool gives a negative response, heat suppliers will be required to re-use the tool every four years thereafter. The Regulations apply across the UK and are enforced by OPSS on behalf of the devolved governments. The enforcement approach taken by OPSS is always to help heat suppliers achieve compliance, although non-compliance can result in financial penalties. The ‘notification template’ is available at www.gov.uk/heat-networks. 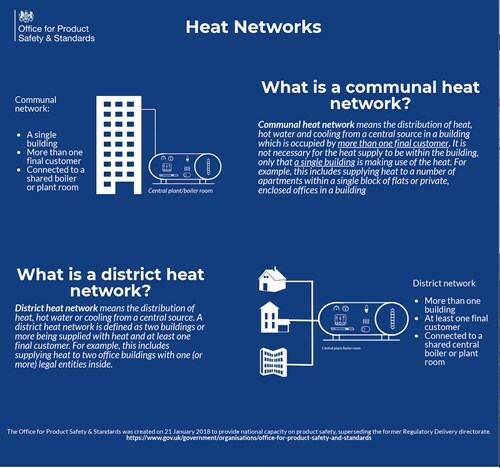 This webpage contains guidance on the types of heat networks considered to be inside and outside the scope of the Regulations. It also contains a list of frequently asked questions. The email address to which completed notification forms should be sent is heatnotifications@beis.gov.uk.